Jcf.driveropt.net Ads, also known as Ads by ViewPassword, are annoying and disturbing pop-up and banner offers which are usually employed to promote unreliable software. Unfortunately, sometimes it may be difficult to identify which ads are presented by the unreliable adware server and which actually belong to authentic advertisers. Due to this, virtual security experts recommend ignoring all online advertisements if your computer does not have a reliable security system supporting it. If you have already been fooled by misleading ads, it is possible that now you need to delete malware. 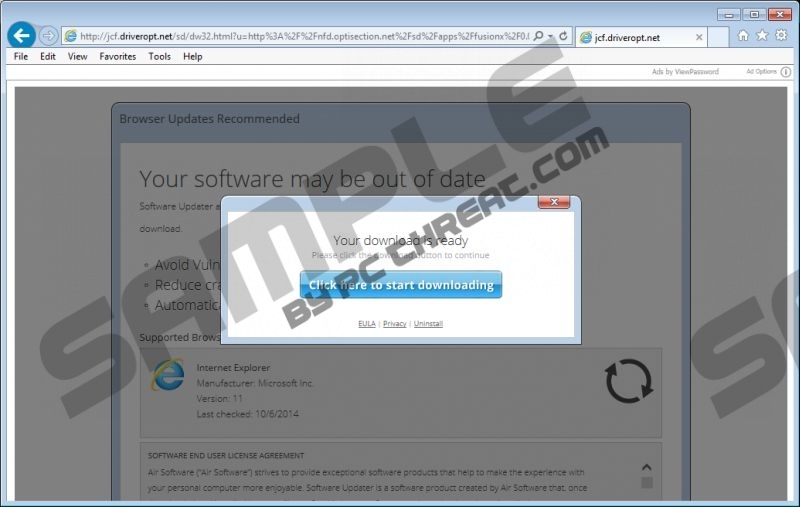 Continue reading to learn how to remove Jcf.driveropt.net Ads related threats. UPDATES RECOMMENDED! It is recommended that you install the software to ensure your browser is the latest version. Please update to continue. If you install software promoted by Jcf.driveropt.net Ads, it is quite possible that more potentially unwanted programs and adware will be installed. In reality, you already need to worry about the removal of adware if Jcf.driveropt.net Ads are flooding. This server may be connected to unreliable websites; however, if the ads keep showing up, it is most likely that an ad-supported program running on the PC has enabled a connection to this advertising domain. Therefore, to disable the disturbing pop-ups, you need to delete adware running on the operating system. Adware removal is not an easy task, and it may be even more complicated if other unreliable applications are running on your personal computer. Install a legitimate malware scanner (SpyHunter offers a free scanner) to inspect the operating system and find out which applications and threats require removal. Delete them manually or, better yet, use automatic malware removal software. Virtual security experts advise that this software should be running on the operating system at all times to ensure reliable Windows protection. It should be used even if manual removal guides below help with Jcf.driveropt.net Ads removal. Move to the Task Bar at the bottom of the screen and click Start. In the menu select Control Panel and then double-click Add or Remove Programs. Locate the undesirable application and Remove it from the list. Open the Start menu from the Task Bar and open the Control Panel. Now move to Uninstall a program to find the list of installed applications. Right-click the program you wish to delete and select Uninstall. Access the Metro UI menu screen, right-click to open a pane and select All apps. In the Apps menu select Control Panel and then move to Uninstall a program. Find the program you wish to delete, right-click it and finally select Uninstall. Quick & tested solution for Jcf.driveropt.net Ads removal.